I know some of you are probably thinking collard tree juice….what the heck is a collard tree. A collard tree is one of nature’s most wonderful gifts. A perennial from the Brassica family that are also known as kale trees or purple collard trees, although the leaves only turn purple in cold weather. They can handle heavy frost and snow as well as warm temperatures into the 90’s before bolting. Collard trees can be started from cuttings and will easily grow to 8’ or 10’ feet tall or more. Simply cut one of the non-woody green shoots and put in a jar of water for several weeks until it grows roots. After that transfer to soil and watch it grow. They develop a heavy woody stem and you simply pick the leaves as they grow. When they become too tall I lop the off at about 24” and they start to grow again. I have not been able to find nutritional info on the collard tree, but am confident it is much the same as the rest of the Brassica family, i.e. kale, cabbage, collards, etc. These vegetables are known as super stars of the vegetable world nutritionally speaking. Collard trees are ideal for people with limited gardening space as they climb vertically. The leaves strip easily from the trunk by pulling up on the stem. They need at least partial sun to grow happily and 3 or 4 trees can provide ample greens for a family of 4 who eat lots of greens. 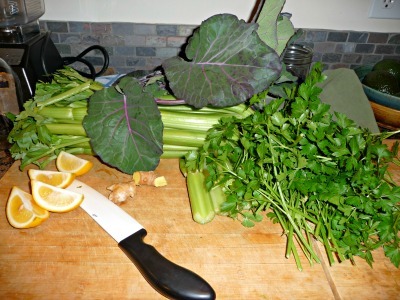 Collard tree leaves are great for juicing, blending in smoothies, and light steaming. 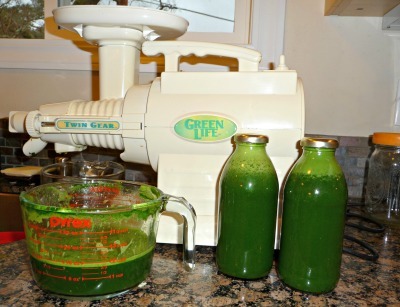 The leaves are a breeze to juice as they self-feed into my Green Star juicer. If you’re blending or steaming strip the leaves off the stems first. The parsley in the recipe is of course another nutritional powerhouse full of minerals. The celery helps cut the strong green taste a bit, but is also chocked full of nutrients. The lemon mellows the flavor further and the acid content helps to readily digest the greens. I love the addition of the fresh ginger root as you well know if you look at my juice and smoothie recipes. Along with its wonderful health benefits it’s a great digestive aid, adds a little kick, and the warming qualities help keep one warm in the cool winter months. If you don't have access to collard tree leaves at this time then simply substitute kale or collard leaves in this recipe.